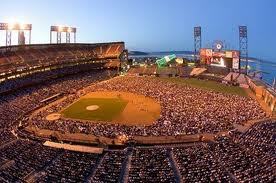 San Francisco Opera's latest Opera at the Ballpark simulcast was, by most standards, an unparalleled success. 32,000 people -- a record attendance in the five years that the company has mounted the program -- flocked to AT&T Park to picnic and watch a live broadcast of SF Opera's current production of Aida last Friday night. As usual I very much enjoyed the event. (What's there not to like about lying on the softest, cleanest grass in the world on a warm evening with friends, a bottle of wine, good cheese and bread and performances by some of the world's top opera singers?) But the choice of opera left much to be desired. Opera broadcasts are very unforgiving on performers' physiques and SF Opera picked the one production in its season that has probably the most uncomely cast of all. Dolora Zajick is an incredible singer. And from a distance at the opera house itself, you can almost believe that she's the teenage daughter of an Egyptian king. But up close when viewed on a screen, the fifty-something star simply doesn't pull it off. And the gaudy costumes and sets designed by Zandra Rhodes make everyone on stage without exception look like escapees from the Trannyshack pageant that also happened to be going on in San Francisco on Friday night. The low-cut square neckline of Marcello Giodarni's costume as Radames was particularly unkind to the tenor's generous thicket of chest hair. A populist opera like Aida is probably the best choice for the ballpark event. But I think something stylistically lighter from the current season featuring more photogenic performers, such as The Marriage of Figaro starring the gorgeous Danielle de Niese and Ellie Dehn, would have been a better choice. Still, once the stage darkened in the final scene, leaving Aida and Radames together to lament their untombely deaths, I couldn't help but be moved. The garish set designs faded away and the singers lost us in Verdi's climactic, soulful music. There was a full moon over the Ballpark that night. I will never forget it.